Yesterday, I enjoyed going round the Forthill Art Group's Annual Exhibition at the Forthill Complex. Thus show exhibits art works produced by residents living in the dispersed sheltered housing at Forthill. Their creativity and artistry has been nurtured by their art tutor Phyllis Fenton. She has clearly encouraged participants to use a variety of stimuli and media, which is reflected in paintings with a variety of subjects. 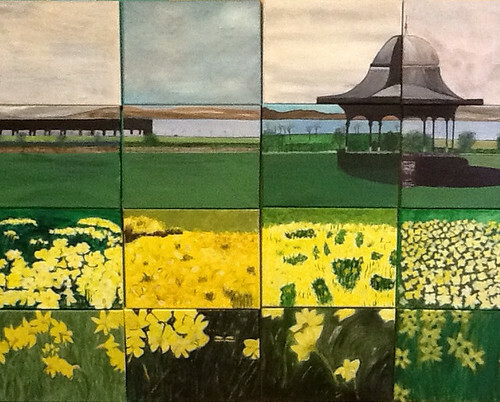 One of the most striking works is the joint piece of sixteen panels making up a painting of Magdalen Green by members of Forthill Art Group - see photo above. Their exhibition demonstrates most powerfully that it is never too late to learn or engage in a new activity. You can catch the exhibition throughout the remainder of the coming week. Just drop into the complex in Forthill Drive Monday 13 to Friday 17 May 2013 08:00 to 16:00.